A very pertinent question being asked in today’s world, filled with evangelists from all religions and sects, standing on rooftops and on TV, shouting at the top of their voices. Everyone it appears want to prove to the world that the Gods they sell are the best, accompanied by miracles in various forms. Most of these evangelists, exploiting the greed of humanity, have amassed wealth that even their Gods cannot fathom. The city of Kottayam in Kerala, which boasts of near cent percent literacy, is better known as the city of three Ls – Latex , Letters and Liquor. It is the trading centre of natural rubber in India and the Indian Rubber Board is also located here. The city boasts of many educational institutions with their glorious past and also is the home for most publishing houses in Kerala with Malayala Manorama and its allied publications leading the pack. It also set many records in liquor consumption, but of late, other smaller towns have leaped miles ahead of Kottayam. 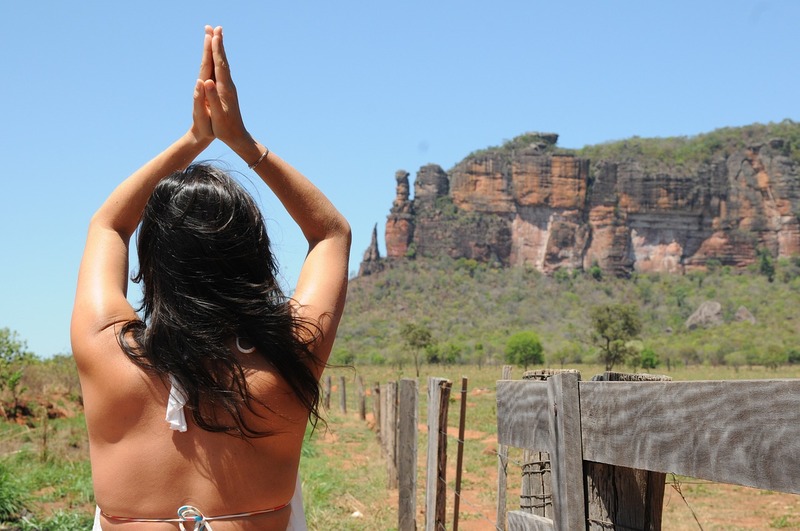 The city boasts of many Hindu temples, Muslim mosques and Christian churches that dot the townscape. It is the headquarters of most factions of the Syrian Christians. Panhandling has been banned in Kottayam since my childhood, but one can always spot a few beggars in and around the town, especially adjacent to religious places of worship. On the days of various festivals in these religious places, an army of beggars, mostly immigrants from the other Indian states, congregate here. It appears to be an organised racket and the way they are moved from one place to another and the methodology employed in locating them at vantage points would put any army to shame. On a Friday morning, a beggar, desperate to get a few bucks as he was really hungry, located himself in front of a mosque in Kottayam. In the afternoon, everyone came for the prayers (Jummah). (The schools in Kerala have a long recess on Fridays, extending till 2:30 PM to facilitate Muslim students to offer Jummah). On culmination of the prayers, everyone folded their caps, dusted and rolled their prayer mats and went home. No one even bothered to give a glance at the hungry beggar. On Saturday morning the beggar placed himself at the vantage point of Shiva Temple of Kottayam. The devotees came in droves (Second Saturday of a month is a holiday for all offices and schools of Kerala) and offered Poojas, Nivedyams and Abhishekams and left and no one gave any offering to the hungry beggar. On Sunday morning the beggar placed himself in front of the Cathedral. He reached there well before the priest and the church manager could even open the doors. During the Holy Mass, Gospel reading was from the Gospel According to Saint Mathews – Chapter 25 – Verses 35 to 40. Verse 35 says “For I was hungry and you gave me something to eat, I was thirsty and you gave me something to drink, I was a stranger and you invited me in.” At end of the mass, priest in his sermon reminded all true followers of Christ that they must feed the hungry as it would be equivalent to any offering to God. The beggar was full of hope that he would surely get something, especially after the priest’s sermon. The Clergy and the Laymen all assembled after the Holy Mass for the meeting and elected committee for the coming year and dispersed. No one gave anything to the beggar. On Monday morning, by about 10′ o clock, the beggar perched in a shady corner, next to the outlet of Beverages Corporation of Kerala (liquor vent). A queue of about 30 people had already been formed, without any jostling or pushing, awaiting the auspicious time of 10 AM for the sale window to open. The salesman at dot 10 AM opened the window and brisk sales proceeded and more people joined the queue. By about 11 AM, the beggar found his pan full of money and overjoyed with it, he prayed to God Almighty. He wanted God to answer his query as to why He gave him His wrong address. God appeared in front of the beggar and explained to him His reasons. “Hence isn’t this the best place in Kottayam for the God to be?”. During our childhood, we recited Psalm 91 as part of the evening Family Prayer (Click Here to Read More about it). In those days I never realised the meaning of the words we recited and did not visualise that it would come handy in the future. During my first stint in the Kashmir Border, sleeping alone in my bunker, the very same words would ring in my ears. These words I realised helped me tide over the difficulties and uncertainties that lie ahead for any soldier in high-altitude terrain, mostly snow covered icy heights, prone to avalanches and blizzards and bone chilling cold. Hence I decided to recite Psalm 91 every evening, (in Malayalam, the language in which my father taught me the Psalm), before I retired to bed. Psalm 91 has for ever been one of my inspirations and a prayer. There is a ‘story’ in circulation by the modern evangelists that during World War I, 91 Infantry Brigade of the American Expeditionary Force (AEF) was preparing to enter combat in Europe. Because their commander was a devout Christian, he assembled his men and gave each of them a little card on which was printed the Psalm 91, the same number Psalm as their brigade. They agreed to recite that Psalm daily. After they had begun praying the Psalm, 91 Brigade was engaged in three of the bloodiest battles of World War I – Chateau Thierry, Belle Wood and the Argonne. Other American units that fought in the same battles had up to 90 percent casualties, but 91 Brigade did not suffer a single combat-related casualty. The truth about this ‘story’ of 91 Infantry Brigade and the Psalm 91 has been cleared By Mary Jane Holt in an article ‘The truth about the 91st Psalm’. The article refers to a communication the author received from Mike Hanlon, Research Editor of Relevance, the Quarterly Journal of The Great War Society: “There was no 91 Brigade with the AEF in World War I. The Brigades’ highest number was 84.” This story appears to have been churned out by an evangelist with a view to cash in on the sympathy the soldiers world over enjoy. The Bible historians believe that Psalm 91 might have been written by Moses, even though most Psalms have been authored by King David. Moses would have written it to inspire the enslaved Israelite soldiers to fight against their Egyptian masters. Hence, Psalm 91 is known as the Soldiers’ Psalm and is also referred to as the Psalm of Protection. There are many testimonies of NATO soldiers keeping a card size print of Psalm 91 in their pockets and also reciting it during their deployment in Iraq and Afghanistan. 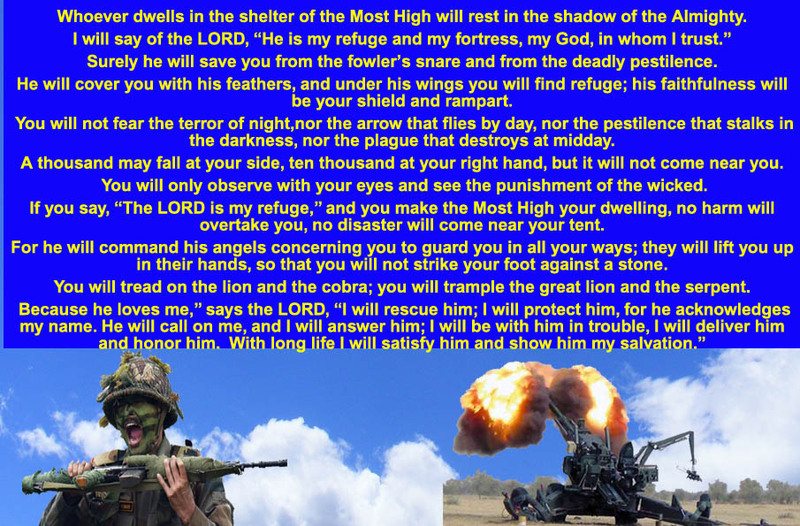 The Psalm as it is, would be applicable to all soldiers irrespective of their faith or religion. The Psalm begins by stating that there is no need to fear because of who He is. Then is a more personal relationship to God as the Almighty is referred to as ‘My refuge, My fortress, My God in whom I trust’. Thus the personal relationship we have with our God enables us not to fear at all. It follows with an affirmation that He will come to your rescue in case of any difficulties and that He will protect you as He would cover you under His wings like a mother bird. Then is the declaration of guarantee by God that He will protect you from all that a soldier may confront in a battlefield like ‘the terror of night’, ‘arrow that flies by day’, ‘the pestilence that stalks in the darkness’, and ‘the plague that destroys at midday’. He also provides you the protection while you rest that no disaster would come near your tent. The God vows to protect the soldier even though thousands may fall on either side. God has commanded the angels to guard you so that you will not strike your foot against a stone. The Psalm further says that you will tread upon the lion and the cobra; you will trample the great lion and the serpent. This act can only be done by a soldier in a battlefield and the soldier has to move ahead facing the enemy’s bullets and nothing can stop him from carrying out his divine duty. For God’s sake, don’t even let the thought about these actions come to anyone else’s mind or even in the mind of a soldier in peacetime, as the wild life protection laws of no nation will ever spare you and please do not expect God to come to your rescue. In Bhagawad Gita, Lord Krishna exhorts Arjuna to fight by saying “O son of Kuntī, either you will be killed on the battlefield and attain the heavenly planets, or you will conquer and enjoy the earthly kingdom. Therefore get up and fight with determination.” Here again the Lord guarantees a soldier the grand honour of the right to heaven.